The other day, I accidentally burned my hand on the stove. Though it was nothing major, the pain was going to be getting in the way of my wire working. I've heard of people using crystals to heal burns so I thought I'd give it a shot. I took a Rose Quartz crystal and held it directly on the burn for an hour. The coolness of the tumbled crystal felt good against the burn and when I woke up the next morning, my burn and blistering was completely gone - as if it never even happened! This was the first time I've tried crystal healing for skincare, so I decided to look a little further into it. Here are some tips and products to use when treating skin ailments with crystals. Recipes for some amazing skincare products are at the bottom of the article! 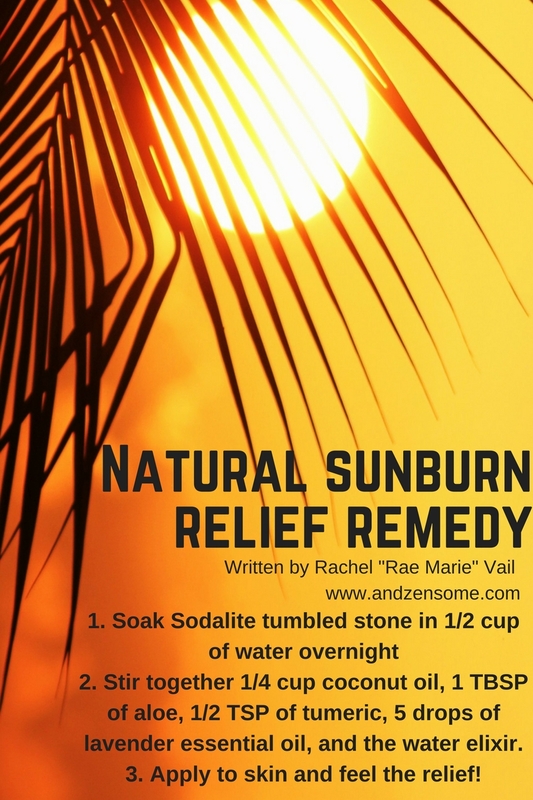 For more painful or severe sunburns, place Sodalite, Blue Chalcedony, or Onyx crystals in a bath of cool temperature. Sodalite, Blue Chalcedony, and Onyx are both great crystals for sunburns and inflammation. You will find being completely immersed in the water infused with this crystal's energy is very soothing. Below are some cheap and natural remedies that you can make in your own kitchen for helping to heal your sunburn. Mix water with Blue Chalcedony tumbled stone for 24 hours. Put in spray bottle with lavender or almond essential oil. Spritz on your burn every 3-5 hours to help the burn go down. Mix with the coconut oil, tumeric, lavender oil, aloe. Apply to skin for pain relief & peeling prevention! Save this graphic for reference! Rose Quartz, as described above, is a good crystal for burns. Chrysoprase and Sodalite can also be used to heal burns. Simply hold the crystal on or near the burn. If you happen to have a smaller piece of the crystal you are using, it would be very beneficial to tape or bandage the crystal on a more severe burn for a couple days. Whenever I have a burn now, I wear a rose quartz pendant throughout the day so I have the energy handy when I need to "re-apply"
Click the pic to snag this treasure! Acne indicates toxicity. Toxicity is not limited to chemicals that are ingested or that make contact with the skin. Toxicities of the emotional body include stress, depression, etc. Toxicities of the physical body include allergies, digestive problems, and diet. These are all examples of acne inducers. There are certain crystals that eliminate toxicity, ease hormonal balancing, de-stress, and more. The over the counter products for things such as acne and oily skin have TONS of chemicals that may not be helping your skin. Amethyst is a great crystal for detoxifying, de-stressing, and balancing aspects of the mind, body, and spirit. There are a few ways to use amethyst for healing acne. One way is to place the crystal directly on the affected area. Another way is to create an elixir. An elixir is made by soaking a crystal in water for 24 hours. Many people will drink elixirs made with different crystals. You can drink an Amethyst elixir to help with skin or use the elixir to wash your face with. Rinsing the skin with the Amethyst elixir will allow the energy to sink right into your pores. It will be very helpful in shrinking your pores. Wearing this stone can also help infuse you with that stone's energy. If you're willing to take your skincare routine further for shrinking pores, reducing redness or blotchiness, moisturizing your dry skin, or healing your oily skin, check out the recipe below! It is a blast to make, especially with friends and lets you incorporate earth into your skin care routine. Strain the Rose petal water in the nut milk bag in a bowl. Pour the strained water into a spray bottle and back with the amethyst. Spritz on your face after a wash or before makeup for an amazing, natural, low cost, crystal infused facial toner. Turn to the energy of this beautiful pink calcite stone for warts and other blemishes and even wounds! If you have a cut, a blister, a wart, or anything of the like, try using a Pink Mangano Calcite crystal on the area. You can hold the crystal there for about ten minutes, twice a day.